This book blew me away. I was going along reading it and then I hit page 300. I went, WHAT IN THE WORLD, and found myself starting all over again. I have never found myself so completely caught off guard and blown away by a twist in a book before. Mary Pearson played me like a fiddle. I truly believe that somehow she is a wizard at writing- she knew exactly how I would imagine each character and then turned everything upside down. This book is full of action, adventure, love, and nothing that I expected. Hands down this is one of my favorite books of the year. I could go on and on about how much I loved it- but instead, I want you to go out and get this book. 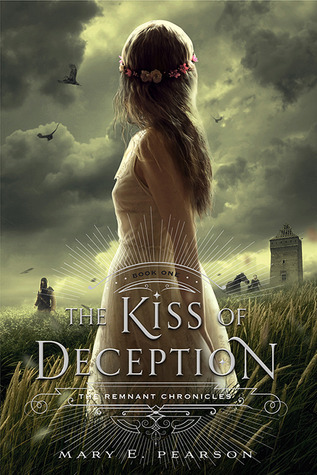 If you read any book this summer, make it the Kiss of Deception- you will NOT regret it. This is a fabulous book and a perfect start to what I expect to be a series on my favorite's list. Why are you still reading this review- go get this book- NOW! I've been dying to read this book, and your review has sold me on it. I'm going to pick it up from the book store ASAP! I loved this one too :-) Glad you enjoyed it!